Hello! my name is pricillia. I'm from Indonesia. Well, I am third grade now. 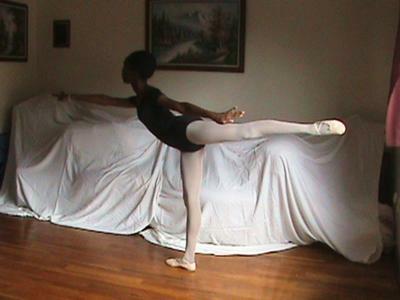 Maybe it's too late for me to learn ballet because I am 20 now....but still I am really interesting with ballet. Thank you for contacting me it is a pleasure to hear from you. If you are interested in ballet, I would definitely reccommend you taking classes as it is an excellent hobby as well as satisfying exercise. Even though most people tend to learn ballet young, I would still say it is not too late for you to take some ballet classes. Although it could prove too late to pursue a career, you could still experience the pleasure of ballet as well as improving your posture and stance. Improving your ability in arabesque will need the effort of flexibility and strength. The areas that need to be supple is mainly in your back and hamstrings. Although the more ballet classes you do, the more overall flexibility you will gain so it is very beneficial to keep takng class in order to improve. It will take time to gain the flexibility, but if you practice and stretch within your range then your muscles will become more pliable. Gently stretch in the splits and also wth your leg on the barre to learn the position of an arabesque. Also, let your teacher explain the basics as it is important to have the correct technique whilst in an arabeque. For example, you want your hips to be square, your abdominals engaged and your back to be long so it does not crunch to be in risk of injury. Always remember, you have to secure these basics of ballet before you can expect to achieve the more challenging positions. Even this may sound simple, the stronger you have grasped the basics the easier the harder steps will feel. So don't rush, be patient and take your time to learn the beauty of ballet! Ballet Exercises - How do i improve my arabesque? Here are two pictures attached below. How can I make my back more upright? It's crunching right now as it is. I've seen this video: http://www.youtube.com/watch?v=ACuVnmS7h9A. I've been trying to roll my thigh in my socket, but I'm not sure how I know that I'm doing it right! How should a correct arabesque "feel"? Could also rephrase/explain this concept further? A few analogies would help. Thank you for contacting me, it is a pleasure to hear from you. It is especially helpful you have attached a picture. From looking at your picture of arabesque, I advise you to slightly lower your leg in order for your back to be more upright. Focus on keeping your back held and supported. It is more beneficial to keep the leg lower until you build more strength in your back. In any ballet position, it is best not sacrifice the placement and alignment for the height of leg. You want to make sure you have the placement correct, so do not worry so much about how heigh your leg is at first. The flexibility will come with practice and time. A correct arabesque should feel aligned and placed. So your leg should be directly behind you, your front arm is going along your eye line and your side arm is supported. Of course your correct posture should also be fully engaged, especially your abdominal muscles to help support your back. To get a more of an idea of how a correct arabesque should feel, practice a simple tendu derriere with your back leg on the floor. This is the correct shape of an arabesque and all that should happen is you lift your back leg, with a slight adjustment in the back depending how high the leg is. So don't focus on pitching forward with the back, always keep the movement lifting up and lengthened. How do I improve my arabesque? I am trying to improve my back strength on arabesques. my back is never straight up, and i don't know how to improve. What can i do to help my arabesque? Try placing your leg on the barre behind you in arabesque. Hold your leg this position and ease into the stretch. This should gently stretch your back and develop more flexibility for an arabesque position. You also need to focus on some particular back exercises to gain the strength. I advise you to ask your teacher to give you some suggested exercises which you can work on.